Ian's mom and dad just celebrated their first anniversary (5 April 2004--although the celebration was postponed until this week by illness and travel). 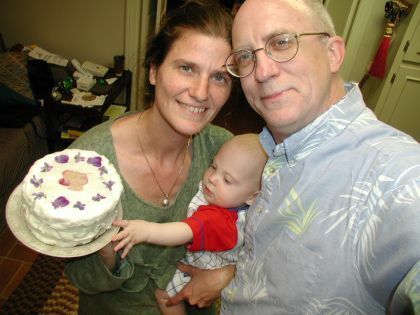 While they were distracted by the camera, Ian sampled the cake. Marysia will have to fill in the details on Ian's first plane trip, but I would like to insert this cute photo of Ian playing on the floor somewhere on Long Island, New York. I stumbled upon this poem by Ogden Nash today. I suspect if Ogden Nash were alive today that he would be a blogger. But how's for an infantile inventory? Here's the prodigy, here's the miracle! For months you have dreamed of flippers or claws. And the presence of lungs can be deduced. P.S. I dedicate this to Reid, the "second child."